Somewhere in Europe is the story of 25 orphaned and abandoned children as they struggle to survive in a war-torn landscape. The interest here is that this 1947 film was shot on location in Hungary, then still freshly scarred by World War II, and features children who really were orphans of the war. Being that close in time and space to the actual event gives Somewhere an honest face that can not be denied. The film begins as a series of wordless vignettes of children exposed to the horrors of modern warfare. Every scene is a tragedy but at the same time just one more story in millions of similar stories. To emphasize the madness of it all, director Geza Radvanyi has one child flee a bombing raid by running into an abandoned carnival’s House of Horrors. Monsters, murderers and a melting wax Hitler terrify the child further. The message is obvious: there is no rhyme or reason here; all is terror and insanity. Left to fend for themselves, the children take to the road where they wander without purpose. They gravitate towards each other in twos and threes until there are more than twenty of them led by the two biggest and oldest boys. They waylay travelers, steal crops and livestock from farmers, and survive any way they can. Soon they are being hunted and shot at by the locals. During their flight they come across the remains of an old castle of ruins older than the current war. Here they find another displaced person, but in this case it’s an old man living alone. He was once a famous orchestra conductor, but the war has made him homeless. The children’s first impulse is to hang the old man just for the sadistic pleasure of it, but the older boy intercedes and saves the old man. This is the bottom of their decent into anarchy, and they stand at the crossroads. Do they stay in the wilderness of savagery or return to civilization? The old man will become both their anchor of stability and their guide back to the world of humanity. Once the children have arrived at the ruined castle, the film switches gears. Whereas the first section is a poetic vision of children and war, the second part is a social commentary on society and civilization. It becomes much more a verbal drama than was the strictly visual beginning, and appropriately so, as it is that dialog that carries the associated philosophy. It could reasonably be seen as a second, complete film. It should be remembered that Somewhere in Europe was made for an audience that would be expected to interpret its meaning. It is acceptable, then, for the film to be so bipolar, because the two contrasting sections highlight the stark difference between anarchic chaos and stabilizing civilization. We also see the ‘thin veneer’ that separates civilization from savagery. This would have been a idea well known to anyone in post-war Europe. There are two distinct sensibilities at play here and I wonder if that reflects the presence of the second creative source, Bela Balazs, who is credited with coauthoring the screenplay. For instance, the war and the life on the road is done in a dynamic visual style that reminds one of Eisenstein with its violent cuts and baroque camera angles. There’s a taste of John Ford’s The Grapes of Wrath, too, in its wide landscapes with tiny lone figures walking across empty fields. The Ford similarity is probably a coincidence but I’ll bet Radvanyi knew Eisenstein’s work and that it had some influence on the look of Somewhere. The second part could be staged in a theater and is much more traditional moviemaking. In that second part, I was struck by the similarity with the 1938 film Boys Town. Whereas the comparison with Grapes might be a stretch, it’s reasonable that Balazs might have known Boys Town from before the war, as it was nominated in 1938 for 5 Oscars and won 2 including Best Writing, Original Story . The whole setup of the orphaned boys and the old Spencer Tracy-like man is just too close for comfort. However, it is this optimism that makes for the one discordant note in the film, and that is that it turns a blind eye towards how bad the situation really was at that time. There is a scene where the children are hijacking a truck. They have swarmed onto the back of the moving vehicle and are enjoying the ride as any child might. One of the boys casually makes a noose out of some wire with which to strangle the driver. He swings around the side of the cab and throttles the man. The truck comes to a stop and they drag the driver out of the cab and throw his body onto the road. Their interest is in any food that might possibly be inside the cab. After the food issue is settled, they then turn their attention to the driver who we find is not dead but ‘asleep’. They drag him off of the highway and tend to him. Up to that point, I understood the driver to be dead or good as dead but with his rescue, there is a softening of the depiction of these wild children. This blunted brutality appears again when the children decide to hang the old man at the castle but then don’t follow through with the murder. When we see this film through the same modern eyes that have seen films like Texas Chain Saw Massacre, that kind of sentimentality may seem soft and insincere. We can hardly fault Radvanyi and Balazs for filtering their memory and making the story as they wished it to be, instead of how it probably would have played out. My suspicion is that it’s quite the opposite. In living the real horror, the filmmakers have no desire to repeat it again, if only in their imagination and on celluloid. 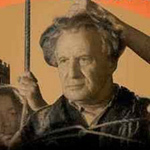 Radvanyi had plans to do three “survivor” films about the homeless people of Europe after WWII. After Somewhere in Europe, he made another film about homeless women in a displaced persons camp in Italy, but then never realized the third film, apparently because of the poor reception of the second. While he may have been an optimist, Radvanyi’s subject matter was probably too close to the mark for most peoples’s tastes at the time. They’d had enough of the war and its aftermath. Seen 60 years later, Somewhere in Europe has many antique and dated features that make it look awkward and quaint. It is a bit rough around the edges and unsophisticated. It may not be as graphic and violent as our modern tastes require. But at its heart it is a fine film and a worthwhile investment of your time. Perhaps now there is an audience for it. There were no DVD extras in the screener, though there was a nice accompanying program note that will hopefully be included in the commercial version. The picture was of variable quality. The beginning was made from a surprisingly clean print. It makes me wonder if the film might have been shown only from the beginning of the “Boys Town” section, leaving off and hence preserving the more “arty” “Life on the Road” section. The remainder of the film looks about as good as you might expect a Hungarian film from 1947 to look. Sound quality is good.